The elephant and the horse share an eye! 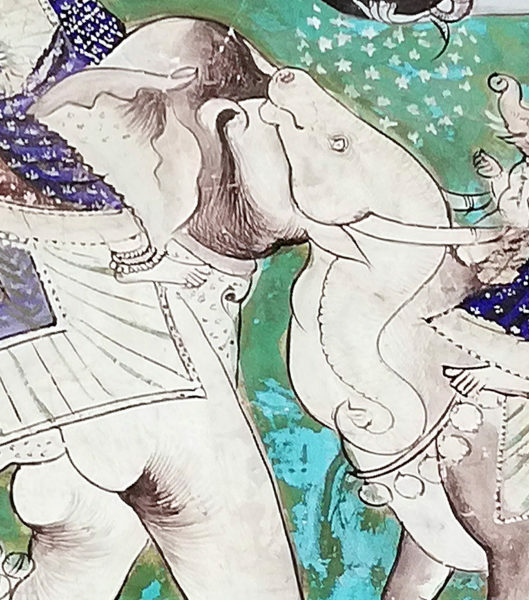 You can see the eye as belonging either to the elephant and its trunk, or to the head of the horse caught between the elephant’s tusks. It’s an optical illusion of a kind unusual in Indian painting. It was brilliantly spotted by my friends Michaela and Eddy Keon, visiting the palace in the beautiful, not so well known Rajasthani hill town, of Bundi. The painting is in a style developed by the unknown artists who decorated the palace at Bundi with glorious murals in the seventeenth century. 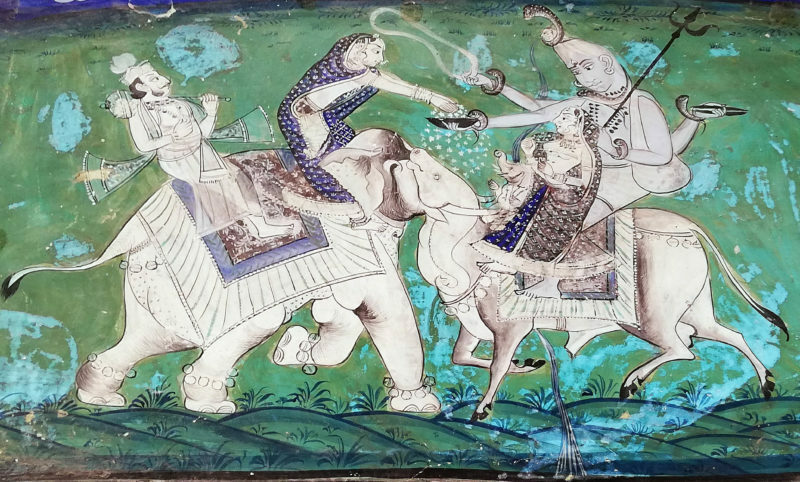 Bundi painting is one of a number of local styles of Rajasthani painting, developed, mostly by artists decorating palaces, separately from the better known contemporary Mughal styles. This movie was suggested to me by my colleague Christopher Tyler, and we developed it together. When the movie isn’t playing, the picture looks like a flat field of dots. But as soon as you run the movie, the scene springs into depth, as we appear to fly past high-rise and other city centre buildings. It’s known as kinetic depth, or structure from motion, and it shows how attuned our brains are to extract information from optic flows, as they stream across the retina, just as much as from images on the retina of static objects. There are particularly beautiful examples of the human figure in motion and of rotating globes on the website of UK researcher George Mather. But no one as far as I know has done a night-time city flyby. We used the 3D animation software Blender. A few weeks back, with collaborators Priscilla Heard and Christopher Tyler, I won second prize with this movie in the annual Best Visual Illusion of the Year Contest. I think we were lucky! As ever the competition showcased some fascinating, quite new illusions, and this year’s were a particularly strong bunch. I’ll be posting later about what we think our illusion shows that’s new. Last year the competition organisers published a beautiful book, showing some of the illusions that won prizes in the years since the competition started in 2005. You can see details on this site. It may take a bit of practice, but you’ll be able to see the silhouette dinosaur rotating either way around. One way round, it’s rotating just like the top right hand of the four coloured dinos. To see it rotate the other way round, start with the head facing left. Then try imagining that the head is getting nearer to you as it goes lower. Once you’ve seen the rotation go both ways, it tends to change spontaneously from one to the other. I’m not great at imagining 3D shapes moving in space. When I set this up, I assumed that when the silhouette rotates the way around that doesn’t match the top right hand coloured dinosaur, it will instead match one of the two left hand dinos, but half a rotation out of step. The top left one is just a mirror reflection of the top right coloured one, and the lower left one a time-reversed version of it. But I wasn’t sure which of the those left hand dinos it would match. (The lower right coloured dino is a reflection plus a time-reversal of the top right one. That switches the rotation twice – back to matching the way around the top right dino goes). But the silhouette dino, when seen as rotating opposed to the top right dino, isn’t like either of the left hand versions! In those, the head is always nearest to us when it’s at its highest, and furthest from us when it is lower down. With the silhouette view clockwise, it’s the other way round: the head is nearest to us when its low down. I think it’s an impossible view, invented by the brain. There’s no way I can get the real dino to give me that view. (Actually – full disclosure – I didn’t film a real dinosaur. It’s a model). I haven’t quite puzzled out why the views work like this. Have you got the maths ability to crack it? 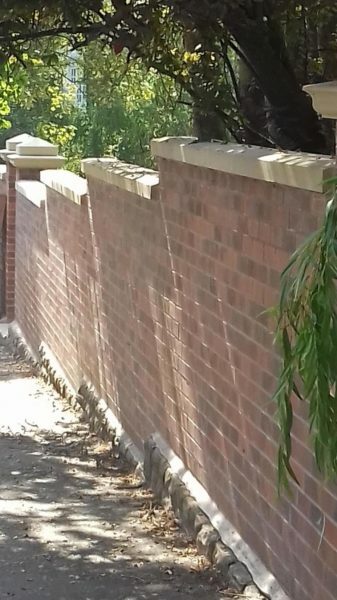 Here is a vivid real world illusion, spotted and photographed by my friend Eddy Keon: it’s a brand new wall in Nottingham, UK, and it’s perfectly vertical, but with these shadows, it looks twisted. The twist seems to be due just to the way the edges of the shadows running down the wall lean over more and more as the eye travels from left to right across the photo. It’s a kind of crazy perspective effect! A friend just told me there are also eye-popping illusion floors in some of the bedrooms of the imaginatively named Seaside Park hotel in Leipzig. 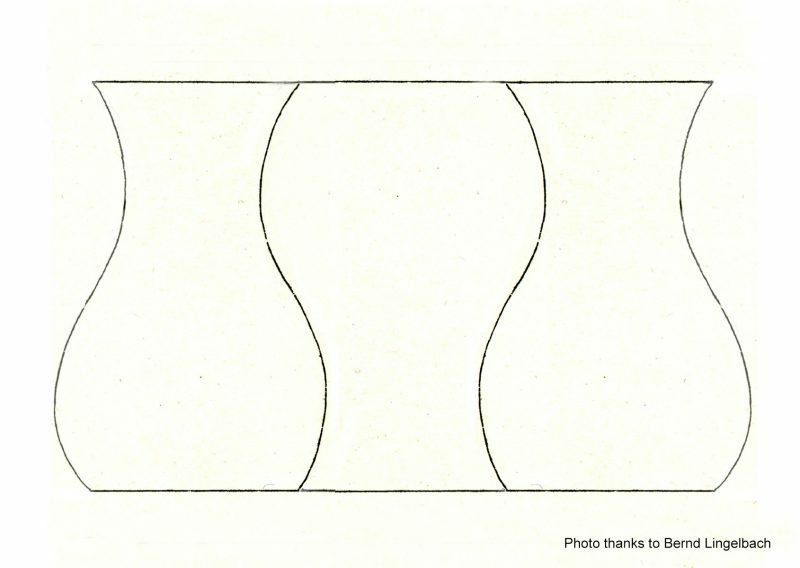 We just got into the final top ten entries in the annual Best Visual Illusion of the Year contest. We didn’t get in the top three, (in fact, we seem to have come last … ) but it’s great to have made the top ten. The movie here is a different version of our competition entry. The illusion is that the objectively static sides of a V-shaped window appear either to expand or to contract horizontally. Figures within the window, expanded at the top and squashed at the bottom into the V-shape, rise or fall at constant speed. At the end of this version, we show that we’ve actually found three fairly different ways of producing this illusion. We found them by studying the reflections seen in novelty illusion rings called Witch Rings as they rotate. We posted about using animations to imitate effects seen in the reflections, in 2013, and then in 2015 and 2016. But now we think the illusion we’ve found in our animations, though an interesting discovery, only makes a small contribution to the very vivid illusion seen in the rings in the real world – the secret of the rings remains mysterious! I’ve copied this beautiful demo (with small changes) from one by Stuart Anstis, who is one of the world’s leading and most prolific researchers into illusions. His website includes a page of great movies, including this one. Whilst the yellow circles are visible, we tend to focus locally on the pairs of spheres, each pair orbiting a central point. But without the circles, loosely fixate the central blob, and though the movement of the spheres remains just the same, they appear to re-group into a more global view, of two pulsating, intersecting circles of spheres. I came across Stuart’s movie amongst the many web pages of figures and demonstrations that accompany a once-in-a-generation, landmark publication, the Oxford Compendium of Visual Illusions. (It’s not cheap – check the price before ordering!). But that’s because it’s HUGE, with some 800 pages. 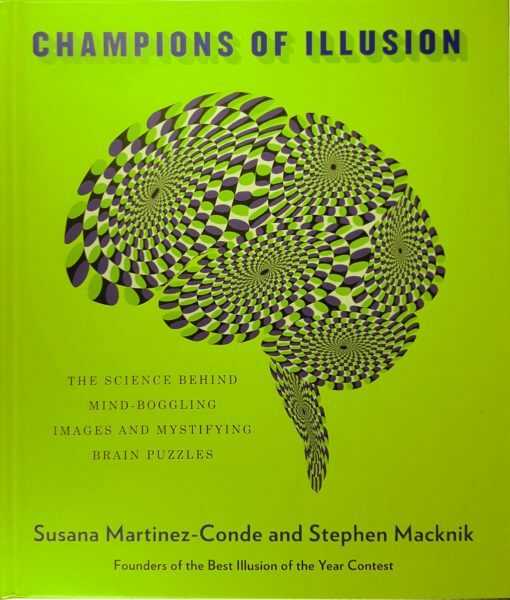 Almost all the leading researchers in the field worldwide have contributed, with essays on the history of visual illusions, up-to-the-minute, detailed discussions of a comprehensive range of illusions and effects, and philosophical essays on whether the word illusion is really the right term to describe them. This may not look a dramatic illusion by contemporary standards: the top and bottom lines are each divided into three equal segments, but the middle segment appears longer than the flanking segments in the top line, and vice versa below. Yet it’s a really remarkable figure. It’s one of sixteen in a pioneering paper of 1855, the first ever study of illusions of this geometric kind. Even more remarkably, as an illusion it remains to this day wholly unexplained, as baffling as it is simple. The paper was by a Frankfurt schoolmaster called Johann Joseph Oppel. In it he named his illusions as geometric-optical illusions, to distinguish them from illusions observed in the natural environment such as the Moon illusion. Oppel seems to have observed the misjudgments that these new geometric illusions give rise to in math lessons, when his pupils were drawing or judging figures on the blackboard. I suspect he was probably an unforgettable but demanding teacher. He was for sure a real one-off – a tirelessly curious observer, leading the way into acoustical and language research, as well as geometric illusions, with fearless independence. Four of us, Nicholas Wade, Dejan Todorovic, Bernd Lingelbach, and I, have just collaborated on the first ever translation of Oppel’s 1855 paper into English, with a commentary, freely available in the online journal iPerception. In the era of Trump it’s got harder to tell reality from illusion, but here’s a ceiling from about 300 hundred years ago that shows a real magician in the illusion line at work. 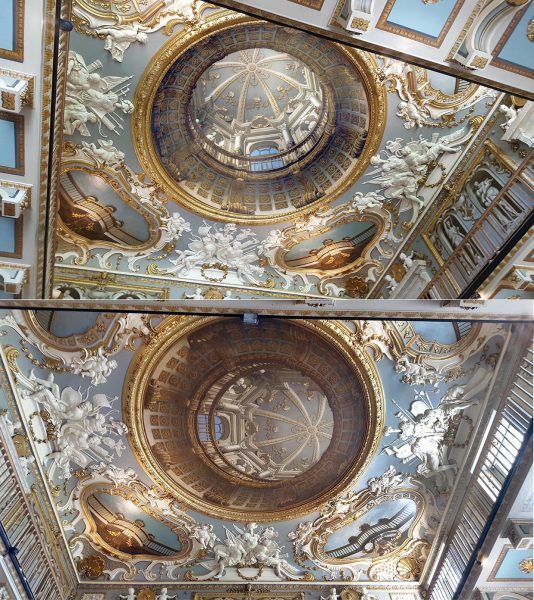 The inside of the dome – everything inside the gold circle – looks as if it extends upwards, but it is just painting on a flat canvas. It’s an example of so-called trompe l’oeil, French for deceive the eye. I don’t know why we use a French term – it was never a French speciality. 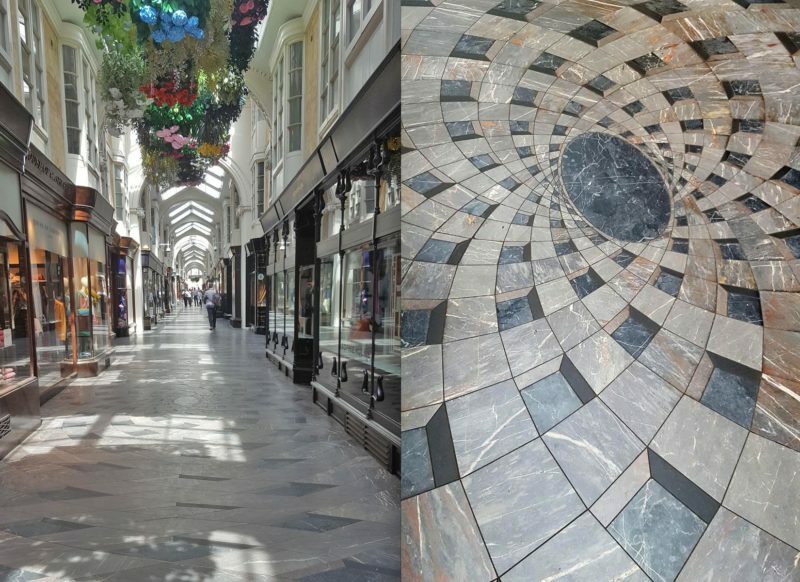 The painting of the hallway was done by a trio of Italian specialists in architectural decoration – Giacomo Amiconi, Gaetano Brunetti and Francesco Sleter. I’m not sure whether Brunetti or Sleter painted the illusory dome. They’re not well known. Painting this kind of thing was quite lucrative, but didn’t make you a star in the art world of the time. Like the dome painted by Pozzo, the illusion in Moor Park is amazingly successful – but only from one viewpoint. As you can see in the lower photo, from everywhere else the dome looks wonky.